Hopefully you followed the International Mountain Guides Mallory & Irvine Everest Research Expedition coverage online. They studied the exploits of the pioneer climbers with historians Jochen Hemmleb and Larry Johnson and had research climbers searching the upper mountain. The team did a heck of a job finding old camps and artifacts. The final tally included the 1922 ABC, 1924 C6, 1933 C6, 1960 and 1975 Chinese C6, and 1960 Chinese C7. The International Mountain Guides 2001 Mallory & Irvine Research Expedition. In addition to spending over 21 man days at over 26,000 feet actively searching, the team also made headlines by performing the highest rescue in mountaineering history. Dave Hahn, Tap Richards, Jason Tanguay, Andy Politz, John Race and Jake Norton gave up summit bids to instead save the lives of six climbers. After the expedition, Jochen and Eric Simonson traveled to Beijing to interview some of the old 1960 and 1975 Chinese climbers. The 2001 expedition story, Detectives on Everest, will be published by Mountaineers Books in 2002. There is some juicy new info for all the Mallory and Irvine buffs out there! Visit the Mallory & Irvine Everest Research Expedition Website for fully archived daily coverage of the climb with text and photos of the search and artifacts found. KATHMANDU, Nepal – Following its historic discovery of the remains of George Leigh Mallory on Mount Everest, the 1999 Mallory and Irvine Research Expedition, led by Eric Simonson of Ashford, Washington, has turned over all artifacts it collected during the expedition to the American Foundation for International Mountaineering Exploration and Research (AFFIMER). On May 2, 1999, the Mallory and Irvine Research Expedition located and positively identified the remains of 1924 Everest climber George Leigh Mallory. The expedition retrieved personal articles and other items and then performed a committal ceremony high on Everest's north face. Items turned over to AFFIMER include handwritten letters, goggles found in Mallory's chest pocket, an altimeter, and a pocketknife. "To ensure ultimate public benefit from these historic findings, our expedition has delivered custody of the Mallory artifacts to the American Foundation for International Mountaineering Exploration and Research, effective today," said Eric Simonson, expedition leader of the 1999 Mallory and Irvine Research Expedition on Mount Everest. "The artifacts are currently being transported to AFFIMER representatives in the U.S."
"We are honored to accept these historic findings and look forward to working with the Mallory family and other scientific and mountaineering organizations to solve the 75-year-old mystery of the fateful Mallory and Irvine Everest summit attempt," said a spokesperson for AFFIMER. During the next several weeks, AFFIMER will work with Mallory family representatives, researchers, and partner organizations to determine permanent custody of these artifacts. The foundation will make final decisions based on respect for the wishes of the Mallory family and thoughtful input from credible international interests, ultimately fulfilling the express objectives of the foundation to ensure these artifacts are preserved for the public benefit. Fulfilling its mission to offer various institutions the opportunity to conduct research, next week AFFIMER will begin accepting proposals for participation in the study of these artifacts. Those interested should send a letter, with supporting documentation of the organization's mission, stating the organization's purpose and intent in examining the artifacts. A co-sponsor of the 1999 Mallory and Irvine Research Expedition, the American Foundation for International Mountaineering Exploration and Research (AFFIMER) is based in New York. Founded in 1990, the foundation is governed by a volunteer board of directors and dedicated to promoting research and public education by obtaining scientific and cultural information through international mountaineering expeditions. Currently Eric Simonson serves as an officer and Board member. The foundation has helped fund several important mountaineering expeditions around the world since its incorporation. 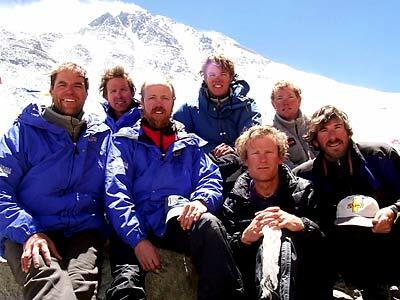 The strongest team ever assembled to do historic research on Mount Everest, the 1999 Mallory and Irvine Research Expedition began March 23 from Kathmandu and was led by veteran climber Eric Simonson of Ashford, Washington. 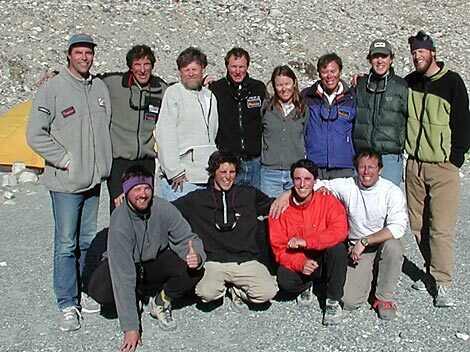 Members of the expedition team included Climbing Sirdar Dawa Nuru Sherpa; Conrad Anker, climber and first discoverer of Mallory's remains; climbers Andy Politz, Tap Richards, Jake Norton, Graham Hoyland, Tashi Dorje Sherpa, Ang Chirring Sherpa, Danuru Sherpa, Pa Nuru Sherpa, Ang Pasang Sherpa, Lakpa Rita Sherpa, Ang Phinjo, and Da Nuru Sherpa; BBC/NOVA high altitude photographers Thom Pollard and Dave Hahn; Peter Firstbrook, BBC producer; Liesel Clark, NOVA producer; Schellen Scott, sponsor photographer; Ned Johnston, BBC/NOVA photographer; Jyoti Lal Rana Sherpa, BBC/NOVA sound technician; research scientists Dan Mann and Bernhard Rabus; expedition doctor Lee Meyers; research historian Jochen Hemmleb; expedition coordinator and research historian Larry A. Johnson; and Pemba Tshiri Sherpa, head cook/base camp support; Lakpa Gelje Sherpa and Pasang Nuru Sherpa, cook/base camp support; and Pasang Chirring Sherpa, science/base camp support. Expedition sponsors include AFFIMER, Mountainzone.com, Lincoln LS, Lowe Alpine, Outdoor Research, Eureka!, Slumberjack, Mountain Hardwear and Vasque Footwear. In addition, media sponsors BBC and PBS/Nova will produce television documentaries of the expedition later this year.